HOW CAN OMIC SCIENCE BE IMPROVED? Kai Simons, founder and CEO of Lipotype, has been following the development of omic science for decades. His lifelong experience as well as his proficiency in lipids and lipidomics has led him to a detailed review. The published article “How can Omic Science be improved?” critically analyzes the shortcomings of modern omic science, which yet could not fulfill its promise of a paradigm shift in medicine and biology. Bot, scientific evolution and present challenges of this field of research are taken into account to picture the overall view. While the article itself focuses on lipidomics, Kai Simon’s field of expertise, all lessons learned can be applied generally to omic science. Kai Simons, CEO and Founder of Lipotype, is talking about being an entrepreneur and why he believes that Shotgun Lipidomics is delivering significant data in the fields of obesity, diabetes, cardiovascular and liver disease. Berlin/Dresden, 4 November 2016: Kai Simons, founding director of the Max Planck Institute of Molecular Cell Biology and Genetics (MPI-CBG) and managing director of Lipotype GmbH, receives the Robert Koch Medal in Gold for his lifetime achievements, in particular for his characterization of membrane-forming lipids and the development of the lipid raft concept. The Award Ceremony takes place on Friday, November 4th 2016 at the Berlin-Brandenburg Academy of Sciences and Humanities. 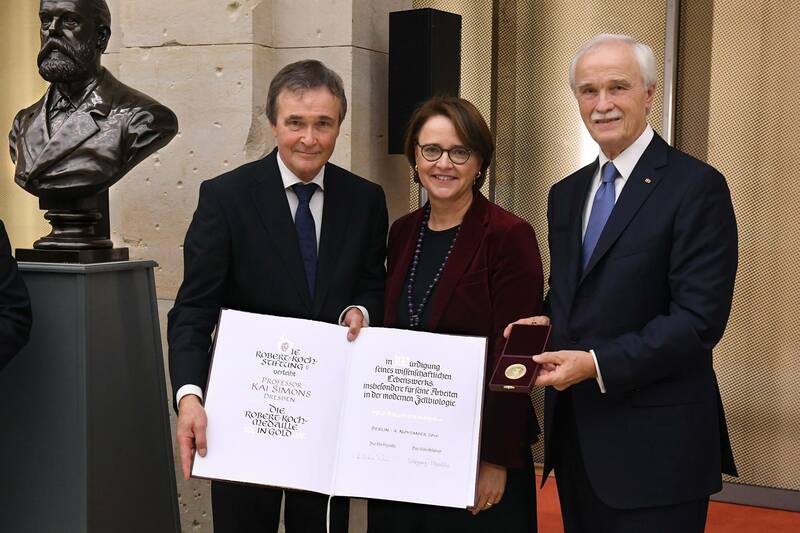 During the award ceremony at the Berlin-Brandenburg Academy of Sciences and Humanities, Kai Simons received the award from Annette Widmann-Mauz, Parliamentary State Secretary, and Dr. Hubertus Erlen, Chairman of the Board of Directors of the Robert Koch Foundation. Professor Kai Simons, Founding Director of the Max-Planck Institute for Molecular Cell Biology and Genetics (MPI-CBG) and Founder/CEO of Lipotype GmbH receives the Robert Koch Medal in Gold for his impressive lifetime achievements, in particular for his characterization of membrane-forming lipids and the development of the Lipid Raft Model. The lipid raft model is linked to new therapy approaches, for example in neurological diseases such as Alzheimer’s, in which malfunctions in lipid rafts play a role. Kai Simons also found clear evidence that many viruses – including influenza, Ebola, measles and HI viruses – use lipid rafts to invade their host cells or to leave them again, by encasing themselves with rafts from the cell membrane. The Robert Koch Foundation is a non-profit foundation dedicated to the promotion of medical progress and is based in Berlin. It promotes basic scientific research in the field of infectious diseases, as well as exemplary projects that address medical and hygienic issues. Patron of the Foundation, which was founded in 1907, is German President Joachim Gauck. Q: Professor Simons, why lipidomics at all? Kai Simons: One class of biomolecules that, for long, remained in the shadow of on-going omics upheaval in biology, were the lipids. The scientific community focused on DNA, RNAs and proteins since these studies promised a shortcut to mechanistic understanding of biological function and homeostasis. Within this context, why care about lipids. They were largely seen as an uninteresting heterogeneous set of molecules having few specific functions. But this is now changing. Lipids not only form the fluid bilayer of our membranes but they interact with proteins and modulate membrane functions. Membrane lipids behave as collectives, form dynamic platforms (rafts) in cell membranes and are major players in metabolism. Therefore, lipids have to be included in our tool kit. Lipid species diversity will only be understood by including lipidomics technologies in the on-going omics (r)evolution. Until now the lipids were mostly excluded. Lipotype wants to change that! Q: What is the vision of Lipotype? Kai Simons: We envision Shotgun Lipidomics as a routine tool in academic research, for the development of functional foods and for clinical diagnostics. Lipidomics represents a quantitative phenotyping tool with incisive multi-parametric resolution. Personalized healthcare will be revolutionized by this new technology. Simply said, our vision and slogan is: Lipidomics for a better life! Q: And what new does your company Lipotype offer? Kai Simons: We want to enable every researcher to try out lipidomics. Thus, with several others, we introduced a very price-competitive package in our service portfolio of lipid analysis. With the minimum amount of 900 Euro a customer can get a basic analysis of 6 biological samples, what gives only 150 Euro per sample! Q: What is unique about Lipotype lipid analysis services? Kai Simons: Lipotype lipid analyses are high-throughput, with broad coverage of lipids and absolute quantitation of each lipid species. Recently, we published a joint paper with Nestlé Institute of Health Sciences, where we showed that the results generated with Lipotype technology are highly reproducible. We performed a comparison and showed that results obtained completely independently at different sites by different researchers have an average coefficient of variation of less than 15%. The high quality standards of Lipotype are based on years of research experience from our work at Max-Planck on the role of lipids in cellular processes and on the development of lipidomics technology. We believe that the advantages of our technology are an essential prerequisite for the identification of statistical significant and clinical relevant lipid signatures, which can now be used by our customers. Q: Lipotype will also introduce a webshop to sell its scientific services. That’s quite new for analytical services. Why did you decide to do that? Kai Simons: Yes, we believe that introducing the webshop is totally novel in our market segment. The advantages will be obvious to our customers. The different service packages are grasped in a glance, prices are known from the beginning and in overall this provides a convenient way to purchase our services. Please sign up for our mailing list and stay informed about our latest news!